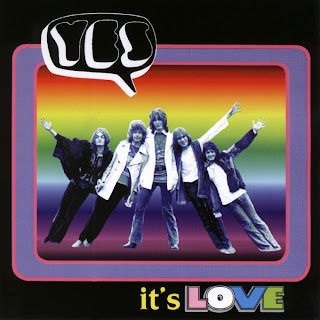 It's Love is a song by The Young Rascals, much redone by Yes (in the style of America, No Opportunity Necessary, etc). Yes didn't release it officially until recently, in their box The Word is Live. This version here is as good as that one, and we also have the regular short set from Yes Album tour, with a long drum solo on Perpetual Change, and Steve also taking some liberties in that one. 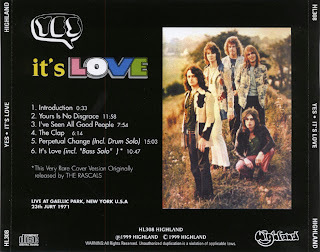 This show by Yes, at Gaelic Park, was a seminal moment for rock music in New York, because it brought a new style of music into the City. Gaelic Park, which is a sand lot baseball field in the South Bronx, had been a venue for rock bands for several summers. We all sat on blankets or the grass and watched the various shows, which featured big name as well as rising talent. There was always the headline act and a warm up band, and sometimes local bands played as an early warm up. Tickets that summer were $4. On this date, Scott Mooney of WNEW-FM came on stage and introduced Yes as the "new band from England". They had not been scheduled to play here and were stopping by at the end of their tour. In fact, they had to borrow instruments to play their songs. Scott announced that Yes had just signed a new Tour contract and that they were on their way somewhere else and could only play a few songs. As the band began to play, we looked around at each other and commented to each other that these guys were good. Before the end of their short set, everyone was on their feet cheering. We shouted out "Yes" to show our satisfaction. The odd thing about this show was that as we enjoyed subsequent bands, Humble Pie and Mountain, everyone shouted "YES" after their great songs. The show ended before Mountain, and the audience, was satisfied (despite other reviews), which led to some bottle throwing at the stage set. But we all knew that we had seen something very special. I went home that night, told my brother Bob, and have been a Yes fan ever since. Seen a lot of bands since then, and I've seen Yes several times since then...but never something as electric as that late afternoon outdoor performance by Yes. Absolutely wonderful. Now I was listening again to this boot, and noticed Jon seems to be confused, or maybe totally stoned... Listen to him speaking, for example describing the vachalia Steve plays as like a Portuguese monstrosity for thrashing with your bare hands. But they still sing and play as well as we're used to. Ocean tales 1974,I put the link of this CD on my blog.Do you mind? I have problem with my line at the moment and I can upload 1 CD in 24 hours.The line is very very slow.I have to change the provider company but I don't want to let my blog sleeping, that the reason why I borrowed you a YES. I used to have this on cassette. Rough sounding bootleg, but crackling with energy!! !